These truly formidable troops are the general's personal bodyguard who accompany him on the battlefield. Selected for their loyalty and martial prowess these elite warriors fear little and shrug off odds that would crush many other units. 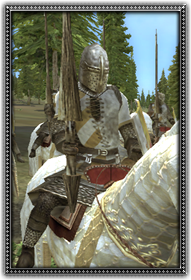 Wearing heavy mail or partial plate and wielding lances this unit is capable of devastating charges and riding down most foes.